FBN’s Tracy Byrnes on Microsoft’s plans to restructure the tech giant. Microsoft (NASDAQ:MSFT) unveiled a long-anticipated and sweeping restructuring on Thursday aimed at allowing the lumbering technology behemoth to innovate at a faster and more efficient pace. As part of the broad shake-up, Microsoft announced a series of executive changes and a reorganization of the $290 billion company by function. “Going forward, our strategy will focus on creating a family of devices and services for individuals and businesses that empower people around the globe at home, at work and on the go, for the activities they value most,” Microsoft CEO Steve Ballmer said in a memo to employees on Thursday. “We are rallying behind a single strategy as one company -- not a collection of divisional strategies,” Ballmer said. While Microsoft continues to have its hands on everything from tablets and search to video-game consoles and mobile phones, it has frustrated investors by failing to generate the kinds of growth and innovation seen at other tech companies like Google (NASDAQ:GOOG). “We have delivered many great products and had much success in market, but we all want more. That means better execution from product conceptualization and innovation right through to marketing and sales,” Ballmer said. Microsoft said the reorganization aims to focus the entire company on a single strategy, improve its capabilities in all areas and increase “collaboration and agility” around those common goals. Read "The Real Reason Behind Microsoft&apos;s Restructuring"
The new Microsoft will be organized around eight functions: engineering (including supply chain and data centers), marketing, business development and evangelism, advanced strategy and research, finance, HR, legal and COO (including support roles and IT). Inside the engineering arm, Microsoft will house its operating system, apps, cloud and devices units. As part of the revamp, Microsoft said Kurt DelBene, previously president of its Office division and a 20-year veteran, is retiring. Ballmer has tapped Terry Myerson to lead the operating systems engineering group, Julie Larson-Green to head up the devices and studios engineering unit, Qi Lu to lead the applications and services engineering team and Satya Nadella to oversee the cloud and enterprise engineering group. Rick Rashid is steeping away from leading Microsoft Research, taking a new role focusing on operating system innovation. Other notable personnel announcements include Amy Hood, Microsoft’s chief financial officer, staying on board as head of the finance group, Lisa Brummell leading the HR team, Eric Rudder leading the advanced strategy and research group and Tami Reller at the top of the marketing team. Despite the slew of changes, Ballmer said Microsoft’s people, spirit, and belief “in the transformative power of technology” remains the same. “It’s why I come to work inspired every day. It’s why we’ve evolved before, and why we’re evolving now. Because we’re not done,” he said. 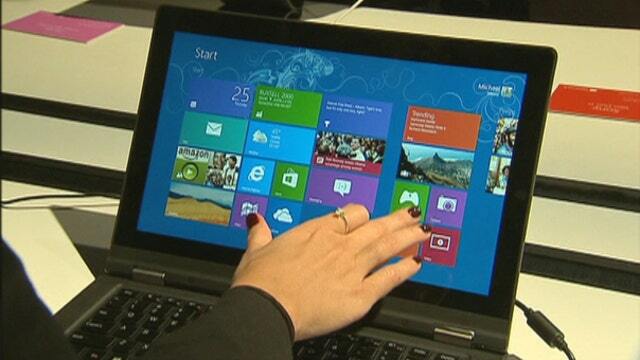 Shares of Redmond, Wash.-based Microsoft responded favorably to the news, jumping 1.5% to $35.22 Thursday morning. The rally leaves Microsoft up 32% on the year, compared with 18% for the Nasdaq Composite.